Given this reality, I believe that key actors in the affordable housing system need to overcome their reluctance to acquire existing apartments and preserve their affordability before it is too late. This is the only way to truly prevent displacement of current residents since they live in buildings that already exist—not ones yet to be built. Several CDCs in Boston and nearby Somerville have begun to do this effectively. We have many brilliant affordable housing professionals in Massachusetts and we should be able to develop scalable models for doing more of this. I'm confident it can be done for less money than we now spend on new affordable housing developments. While housing displacement gets most of the attention, I am increasingly concerned about cultural and economic displacement. When longstanding, locally-owned small businesses are forced to move (or worse, close), it impacts not only the business owner, but the entire community. Similarly, as the demographics of a place change, many residents feel the loss of their cultural community and home. Advocates are now fighting to help local businesses stay open. CDCs and others are increasingly using the arts and creative place-making (and place-keeping) to claim (and retain) their communities' historic and cultural narratives. The good news is that, compared to housing development, these interventions are relatively inexpensive. The bad news is that there is little public funding to support such programs. This needs to change. On balance, I'm generally inclined to support new development, but only if it is done wisely. I think we need to mitigate the impact of new development with more than just inclusionary units. Fighting over 15, 20, or even 25 percent affordability levels does not confront the core issue of neighborhood change. Instead, we should use some of the resources generated by new development to attack displacement more directly through measures such as acquiring existing properties, providing financial assistance to current homeowners and tenants, supporting locally-owned businesses, and making cultural investments that preserve a community's history and culture. We should also push for more three-bedroom units in new buildings because those units would allow more families to move into changing neighborhoods. Those families, in turn, not only might enroll children in local school,s, but they also are likely to press for improved schools, which would benefit all of the neighborhood's families. The Philadelphia Energy Campaign (PEC) is an unlikely success story of a municipal climate initiative prioritizing the needs of its marginalized residents by preserving affordable housing through energy policy, according to Caroline Lauer, a recent graduate of the Harvard Graduate School of Design, whose thesis on PEC received the 2018 Joint Center for Housing Studies Best Paper on Housing Prize. In "A Pathway to Preservation? Planning Processes at The Intersection of Climate Change and Affordable Housing in Philadelphia, Pennsylvania", Lauer, who received a Master of Urban Planning, provides a detailed case study on PEC's history and goals, and links that history to literature on both planning and public policymaking. PEC has an ambitious set of goals, writes Lauer. It aims to create jobs, strengthen communities, cut energy bills, and reduce Philadelphia's carbon footprint by leveraging $1 billion of public and private investment over ten years. This effort, she explains, is especially notable because, while cities across the United States have been actively planning for climate change for at least two decades, equity considerations, such as the impact of climate investments on disadvantaged communities, have often been overlooked or ignored when those plans have been prepared and implemented. According to Lauer, the Philadelphia Energy Authority, which was created in 2010, became a notable exception largely because of the values and skills of Emily Schapira, who launched the PEC campaign not long after she became the authority's executive director in 2016. Lauer observes that, while the typical focal point of an energy initiative is the fastest or most efficient way to reduce energy consumption, the focus of the PEC has been the residents who will benefit the most from the energy reduction today. She adds that by "inextricably linking equity and energy, the PEC prioritizes the needs and interests of the many low-income and minority residents" in Philadelphia, which not only has the highest poverty rate of the ten largest American cities but has relatively old, poorly-maintained, energy-inefficient housing stock. Moreover, she notes that Philadelphia, a Democratic stronghold, has had to do much of this work without significant support from the state legislature, which was overwhelmingly Republican when the campaign got underway. Succeeding in this complex milieu, she notes, has required skilled and committed leadership that not only is attuned to equity and energy issues but also is cognizant of, and responsive to, political considerations. Combining these approaches can be difficult, writes Lauer, who observes that "community development efforts to preserve affordable housing through energy efficiency are rare." However, she adds, "PEC demonstrates that merging both objectives into one program is a viable policy option." 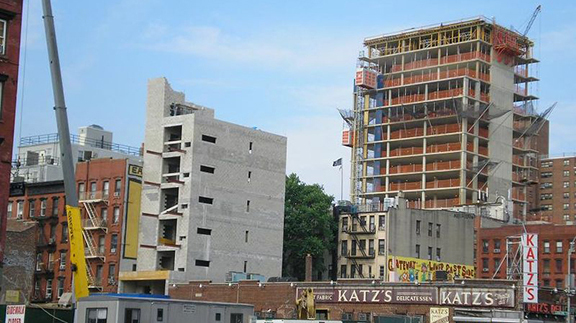 How Do We Proactively Preserve Unsubsidized Affordable Housing? Robust land bank and land trust partnerships, long-term lease-purchase programs, and low-interest renovation loans with affordability requirements are three tools that policymakers and mission-driven organizations can use to get ahead of real estate price appreciation, according to Proactive Preservation of Unsubsidized Affordable Housing in Emerging Markets: Lessons from Atlanta, Cleveland, and Philadelphia, a new working paper jointed published by the Joint Center for Housing Studies and NeighborWorks® America. Written by Matt Schreiber, a Master of Urban Planning student at the Harvard Graduate School of Design who was a 2017 Edward M. Gramlich Fellow in Community and Economic Development, the paper draws on work done by public and non-profit entities in all three cities. In those places, Schreiber notes, median house prices range from $60,000 to $250,000, which suggests that they have an ample supply of affordable units. However, housing in those markets actually remains out of reach for so many residents, whose incomes are not growing as rapidly as house prices, which, according to Zillow's Home Value Index, rose by 8-11 percent in 2017. Such increases, and the fact that prices rose in more than 90 percent of the zip codes in those three cities, led Schreiber to ask what policymakers and the leaders of mission-driven organizations could do to get ahead of real estate price appreciation and, in doing so, proactively preserve their city's stock of affordable housing. Schreiber used a four-part methodology to answer this question. First, he identified emerging markets; those areas that have not yet experienced the price appreciation effects of gentrification, but are likely to do so in the near future because they are close to each city's central business district, anchor institutions, or its other already-gentrified areas. Second, he reviewed the housing stock in these "likely-to-gentrify" areas, which made it clear that most of the affordable housing in these places are unsubsidized units located in one-to-four unit buildings. Third, he interviewed local stakeholders and national experts to learn their views on promising ways to find the balance between improving the quality of the housing stock while preserving its long-term affordability for low-income residents. Those interview informed the fourth and final step: identifying and assessing three strategies that may address this challenge: building stronger partnerships between local land banks and local land trusts, creating lease-purchase programs that make homeownership more accessible for people of modest means, and offering low-interest loans that help owners renovate unsubsidized affordable units in return for long-term commitments to keep those units affordable for many years to come. Taken together, he notes, these strategies can help maximize the efficiency of the limited resources available to preserve and develop affordable housing. Moreover, the experiences in the three cities suggest "it is possible for mission-driven organizations and policymakers to get ahead of gentrification and proactively preserve vulnerable, unsubsidized affordable housing for low-income residents." What Would It Take for Cities Experiencing Gentrification Pressures to Foster Inclusion Rather than Replacement? Can Gentrification Be Inclusive? by Ingrid Gould Ellen notes that while gentrification raises fears of displacement, it also offers some hope because the growth in higher-income households in previously poor areas can help to shore up city tax bases and possibly spur economic and racial integration. However, she warns, absent policy intervention, integration may be only fleeting because, left to its own devices, the market is unlikely to deliver on the promise of long-term integration. After reviewing some of the literature on gentrification, Ellen discusses three promising strategies. The first is to preserve existing affordable housing units in changing neighborhoods by investing in public housing, extending affordability restrictions on privately-owned units. The second is to expand the stock of long-term affordable units by making more strategic use of publicly-owned land, as well as tools like inclusionary zoning. The third is to work with local community groups to help ensure that low- and moderate-income residents can benefit from the expanded economic, educational, and social opportunities present in gentrifying neighborhoods. However, she cautions, none of this is easy or cheap. Some deals will simply be too expensive, but city and community leaders who wish to make gentrification more inclusive should be vigilant in searching for opportunities. We Live Here Too: Incorporating Residents' Voices in Mitigating the Negative Impacts of Gentrification by Malo Hutson focuses on strategies for ensuring key actors hear and respond to the concerns of long-term residents in gentrifying areas. Hutson starts by reviewing key causes and consequences of gentrification, and notes that responding to its effects requires that longstanding community residents organize and make their voices heard. Moreover, he contends, governments and developers should work to include such residents in the planning of urban revitalization project from the outset. Hutson reports that community leaders in cities like Boston, Washington DC, and San Francisco have formed (or are forming) community coalitions focused on protecting their interests and transforming their communities into sustainable, healthy communities. Moreover, unlike some past efforts, these coalitions are not fighting to stop economic development and growth; rather, they are struggling to be a part of the new economic and social transformation taking place in their neighborhoods. Many of these initiatives, he adds, make use of legally-binding Community Benefits Agreements (CBAs), which define goals for housing, employment, and other facilities and programs that will be provided by the developers of major new projects. Such approaches, he notes, require not only extensive consultation with affected communities, but also that community leaders be willing to compromise. While a willingness to compromise has become more difficult in our current hyper-polarized political and social environment, he observes, it is often necessary for a community's goals to be realized. What More Do We Need to Know About How to Prevent and Mitigate Displacement of Low- and Moderate-Income Households from Gentrifying Neighborhoods? by Vicki Been notes that while local governments, land use and housing officials, and affordable housing providers and advocates are scrambling to find effective ways to counter concerns about displacement, urban policy researchers have thus far found little evidence that lower-income renters move from gentrifying neighborhoods at higher rates than they move from non-gentrifying areas. Moreover, she adds, researchers generally have not thoroughly assessed the efficacy of many policies that jurisdictions use to address concerns about gentrification and displacement. She goes on to review what is known—and what is unknown—about the six strategies that comprise the current "toolkit" for addressing gentrification and displacement. These are: preservation of existing affordable rental units; protections of long-time residents who wish to stay in the neighborhood; inclusion to ensure that a share of new development is affordable; revenue generation that harnesses growth to expand financial resources for affordable housing; and property acquisition of sites for affordable housing. She concludes by noting that policymakers considering potential remedies should be mindful of how little we know about the problem or potential solutions. That is not to say that jurisdictions should ignore the tools available; rather, the point is that researchers could provide significant value to policymakers by helping to fill some of the gaps. Additional papers from the A Shared Future symposium are available on the JCHS website. The papers will also be collected into an edited volume to be published later this year. First came the Pew Research Center, which in January 2018 issued a report titled "They're Waiting Longer, but US Women today are More Likely to Have Children Than a Decade Ago." However, less than a month later, The New York Times published the seemingly contradictory headline: "American Women are Having Fewer Children than They'd Like." What about the increase in motherhood highlighted in the Pew report? Motherhood is measured in that report by the share of women in each cohort having ever had a live birth by age 40-44. While that report indicates that the share of mothers is rising, there are important questions about the magnitude of its reported increase in motherhood. Specifically, the Pew report is based on an analysis of the Current Population Survey's biannual June Supplement, which asks women detailed questions concerning all children they have had over a lifetime. And these CPS data appear to show a significant recent increase in motherhood. However, some of the differences are due to measurement errors that produced the lower motherhood shares in the CPS prior to 2012. As a 2015 Census Bureau working paper on this topic noted: "The June 2012 Current Population Survey (CPS) Fertility Supplement data showed a significant decrease from 2010 in the percent of women aged 35-44 who are childless... However, due to numerous changes in data and data processing, it is reasonable to think that some of the apparent changes shown in the data may be artifacts of changes in measurement, not an indication of an actual demographic shift." With the Foreclosure Crisis Behind Us, Have We Stopped Adding Single-Family Rentals? A decade of growth in the single-family rental market has fundamentally reshaped the nature of rental housing across the country, with states hard-hit by the foreclosure crisis seeing particularly notable changes, according to Joint Center analyses of data from the American Community Survey (ACS) and other sources. Our review also showed that the stock of single-family rental homes, which grew dramatically between 2006 and 2014, has been roughly stable for the last few years. According to the ACS data, the nation's stock of single-family rentals grew from 12.2 million units to 16.1 million units in 2016, with virtually all of the growth (99 percent) occurring between 2006 and 2014. This 32 percent increase in the single-family rental stock far outpaced the 11 percent increase in the nation's stock of multifamily rental units, which grew from 26.0 million to 28.9 million between 2006 and 2016. As a result, single-family homes now represent more than one-third (34 percent) of the rental stock nationwide. Additionally, the growth in single-family rentals has provided an important source of housing for families with children. In fact, single-family homes accommodated 84 percent of the growth in renter households with children between 2006 and 2016. However, most of these new rental units were not new construction. According to our analysis of data collected by the US Census Bureau, between 2006 and 2016, only 366,000 new attached and detached single-family homes were built as rental units. This, in turn, indicates that about 3.5 million of the single-family rental units added to the stock 2006–2016 were existing structures that had previously been owner-occupied homes. This trend of converting single-family homes to rentals was unevenly distributed across the country, with the greatest increases occurring in the states with higher than average foreclosure rates, according to JCHS analysis of data from the Mortgage Bankers Association and the ACS (Figure 1). For example, between 2006 and 2016, Nevada's stock of single-family rental units grew by 63 percent—faster than any other state in the country. And the foreclosure start rate in Nevada peaked at 3.8 percent in 2009, the highest rate of any state 2006–2016 and more than double the nation's peak rate of 1.4 percent. Arizona and Florida also experienced particularly high foreclosure rates and unusually large increases in their stocks of single-family rental units. Arizona's foreclosure start rate peaked at 2.6 percent in 2009, and its single-family rental stock grew by 61 percent between 2006 and 2016. Florida's foreclosure start rate hit a high of 2.8 percent in 2009, and its single-family rentals grew by 50 percent int he decade leading up to 2016. While these data do not tell us exactly how many of these homes completed the foreclosure process and were subsequently converted to rental units, they do suggest that, as many have reported, large numbers of foreclosed homes were bought by investors who converted them to rental units. Note: Single-family rentals include detached and attached single-family homes. Stock estimates include renter-occupied units and units that are vacant for-rent. The MBA National Delinquency Survey reports the rate of mortgage loans that are in foreclosure as a percentage of the number of loans serviced during the quarter. The survey sample includes about 85% of the US market for first-lien 1-4-unit mortgages. However, since 2014, the foreclosure inventory has largely cleared and few new foreclosures have been filed. Not surprisingly, there was also little growth in the stock of single-family rental units 2014–2016. Illustratively, the number of single-family rentals grew by an average of 483,000 a year between 2006 and 2014, but between 2014 and 2016, the stock grew by only 22,000 units. It remains to be seen if this recent shift is a short-terms pause or if it represents the culmination of the past decade's trend of significant growth in single-family rentals. Faced with the increased threat of natural disasters, some community-based organizations are trying to link their efforts to better plan for catastrophic events with their existing efforts to address issues like affordable housing and economic development, according to "Bounce Forward, Not Back: Leveraging Resiliency to Promote Equity," a new working paper jointly published by the Joint Center for Housing Studies and NeighborWorks® America. Written by Caroline Lauer, a master in urban planning student at Harvard's Graduate School of Design who was a 2017 Edward M. Gramlich Fellow in Community and Economic Development, the paper draws lessons from the growing literature on resiliency and from two case studies of notable initiatives carried out by organizations in NeighborWorks' national network of independent, nonprofit organizations focused on affordable housing and community development. 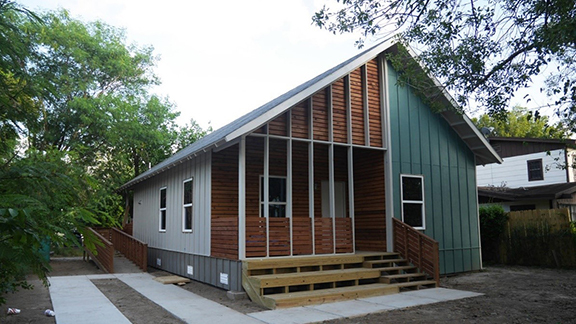 The first case study describes work done by the Community Development Corporation Brownsville, which has worked with several other community groups to develop RAPIDO, a holistic approach to disaster recovery that, "aims to quickly and affordably rehouse individuals and families, building social capital within the community, and stimulating the local economy." The key to this effort, Lauer explains, is providing families with, "a simple 480-square-foot [structure] that contains essential facilities," and training a group of "Navigators" who can lead residents through the disaster recovery process. The units, which cost about as much as the temporary manufactured units typically provided to people who have lost their home to natural disaster, "can be built easily at local lumberyards, transported by basic trailers, and assembled on-site in three days by four people." Moreover, unlike the temporary housing, the units are permanent and can later be expanded. The second case study focuses on NeighborWorks® Umpqua's Southwestern Oregon Food System Collaborative (SWOFSC) Seafood Project, a multi-faceted effort to address the struggles of the region's small-scale fisheries. This effort does so by investing in and fostering local processing facilities and other infrastructure to support local fishermen. At the same time, it also uses marketing and other strategies to increase the local and regional demand for less traditional types of seafood that, because of warming oceans, comprise increasingly large shares of what local fishermen are bringing into port. Moreover, the project leveraged these economic development initiatives to help the region prepare for both slow-moving disasters, such as the effect of climate change on the fish population, and for acute disasters, such as a storms, tsunami, or earthquakes that might reduce or even cut off the region's access to the mainland for an extended period of time. Although the initiatives are quite different, and while it is too soon to fully gauge their effectiveness, Lauer contends that together they offer three important and timely lessons given the hurricanes that hit Texas and Puerto Rico and the wildfires that devastated parts of California and other western states last year (after she had carried out her research). First, their differing trajectories show that while efforts to link community and economic development initiatives with projects that are focused on resiliency and disaster response can have different starting points and program structures, they can still achieve similar goals. Second, both show that regardless of how they start and are structured, such efforts should focus on creating social and physical connections and structures that can be used to address a variety of pre- and post-disaster conditions, including structural inequality. Finally, she notes, such efforts strengthen a community's ability to respond not only to anticipated problems but to unforeseen challenges and potential disasters. New York City is an increasingly expensive place to live, and housing prices are dramatically outpacing incomes. In fact, over the past 25 years, home prices have increased 200 percent while incomes have remained stagnant. Moreover, today, half of the city's renters and 37 percent of its homeowners are considered housing cost burdened. In his recently released symposium paper on "Expanding Access to Homeownership as a Means of fostering Residential Integration and Inclusion," Christopher Herbert presents a compelling case for making homeownership more affordable and accessible to achieve higher levels of residential integration and inclusion. At the Center for NYC Neighborhoods, a nonprofit that protects and promotes affordable homeownership in New York, we have seen firsthand the essential role homeownership plays as a bulwark against displacement within the context of gentrification and increasing unaffordability. In addition to enthusiastically endorsing Herbert's policy recommendations to promote new homeownership opportunities, we also encourage policymakers to develop approaches that support existing homeowners. Current discussions of housing mobility generally focus on the importance of supporting families who choose to move from racially-segregated, high-poverty neighborhoods to neighborhoods with greater racial integration and economic opportunities. This is, of course, a worthy goal. Yet, the goals of choice, inclusivity, and opportunity also require us to support families who are at risk of being forced to leave neighborhoods due to rising costs. By supporting families who are vulnerable to displacement, we can promote inclusion and ensure that families of all backgrounds and incomes have access to economic opportunity and improved neighborhood conditions. The Center for NYC Neighborhoods spent 2017 studying what happens to families in one such neighborhood: East New York, in Brooklyn. Home to thousands of black and Hispanic working-class homeowners, East New York has historically been one of New York City's most affordable neighborhoods. Like many communities of color around the country, it continues to be battered by the legacy of the Great Recession and high rates of foreclosure. But, in recent years, home prices have spiked and the neighborhood has experienced an influx of investment and increasingly affluent residents. Labeled Brooklyn's "last frontier" by real estate investors, the neighborhood's longtime homeowners and tenants face increasing uncertainty. For our study, we tracked East New York residents who moved out of their homes between 2012 and 2016, focusing on homeowners who were facing foreclosure. We found that homeowners with mortgage distress who stayed within the city tended to become renters, contributing to a saturated rental market in the few remaining affordable neighborhoods. We also found that homeowners who left the city tended to move to places with more affordable housing, but at the cost of access to jobs, higher transportation costs, and reduced economic mobility. Streamline and expand home repair resources: Unaffordable home repairs are one of the biggest challenges for lower-income homeowners, and existing resources are often unable to meet the need. Continue to fund homeowner stabilization assistance: Foreclosure prevention services face major cuts in New York, as well as nationally, yet tens of thousands of homeowners continue to struggle to avoid foreclosure. We recommend continuing to support these vital services and developing innovative new programs to promote homeowner stabilization, such as financial empowerment counseling and matched savings accounts. Reform policies towards tax- and water-bill-delinquent homeowners: Many lower-income homeowners struggle to afford property tax and water bills. When faced with the prospect of an in rem or tax lien foreclosure, they may feel they have no other choice than to sell their home, which can further stoke the loss of affordable housing. We recommend developing income-based repayment plans and alternative debt servicing models. Support homeowner-landlords in order to support tenants: Rental units in owner-occupied homes provide a major source of affordable housing. However, the future of these units is at risk. We recommend developing incentives for homeowners to provide rental units that are affordable for low-income individuals or families leaving homeless shelters, as well as legalizing safe basement apartments and other accessory dwelling units. These reforms would have the joint benefits of stabilizing existing homeowners' finances and creating additional affordable housing opportunities for renters. Strengthen local incomes and economic opportunity: We recommend improving access to good jobs through neighborhood-targeted workforce development, job access strategies, and living-wage policies. Tax policy maters, too. For example, many of the homeowners we serve do not earn enough to benefit from the Mortgage Interest Deduction. As Herbert recommends, converting the deduction to a credit would provide direct assistance that is better targeted to lower-income homeowners. Our ability to protect the working- and middle-class homeowners in neighborhoods like East New York will help decide whether New York City will remain a place of opportunity for all people, or only for real estate investors and the wealthy. Moreover, these efforts could serve as a model for people concerned about similar problems in other cities. Taking these steps requires us to recognize that there is nothing natural about displacement and that solutions exist to support vulnerable homeowners and their tenants. This post is a response to the Panel 5 papers that were presented at our A Shared Future symposium in 2017. These papers are available on the JCHS website. The robust pace of spending on home renovations and repairs is expected to stay strong over the coming quarters, according to our latest Leading Indicator of Remodeling Activity (LIRA). 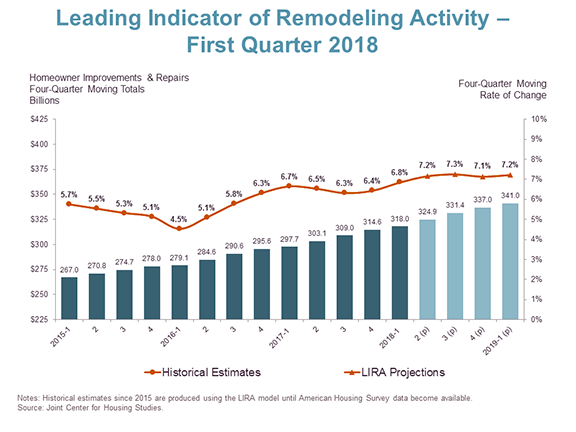 The LIRA projects that annual growth in homeowner remodeling expenditure will remain above 7 percent throughout the year and into the first quarter of 2019. Strengthening employment conditions and rising home values are encouraging homeowners to make greater investments in their homes. Upward trends in retail sales of building materials and the growing number of remodeling permits indicate that homeowners are doing more—and larger—improvement projects. While the overall outlook is positive, one area of concern is the slowing growth in sales of existing homes, since sales traditionally trigger significant renovation spending by both sellers and buyers. Even with this headwind, annual spending on residential improvements and repairs by homeowners is set to exceed $340 billion by early next year. The three papers from the rich and provocative A Shared Future symposium that focused on what it would take for housing subsidies to overcome affordability barriers to inclusion in all neighborhoods provide a multi-faceted and nuanced set of approaches that would expand possibilities for lower-income, non-white families to live in higher-opportunity communities. While these are important approaches that should be part of the policy portfolio, efforts to expand opportunities should also recognize that tenant-based vouchers are, and will likely remain, the primary policy tool for enabling poor and near-poor families to live in higher-opportunity communities. In his paper, Chris Herbert reminds us that, typically, the housing stock in high-opportunity communities is predominantly owner-occupied. So, as part of a comprehensive portfolio, it’s important to consider strategies to make it possible for low-income (and other) families of color to purchase homes in such neighborhoods, including those where rents are starting to rise. However, even a robust set of tools to overcome downpayment and credit barriers may not be sufficient to make for-sale homes in neighborhoods with good schools and other amenities in many regions within reach of low-income families. Both Steve Norman and Margery Turner highlight the key role acquisition by committed owners of multifamily rental properties can play, both in keeping rents affordable in “emergent” (i.e., gentrifying) neighborhoods and in making more units available to families with housing vouchers in those and already higher-rent communities. Federal housing policy has neglected such acquisition strategies: grants are rarely available to reduce the amount of debt such purchases will require, and tax credits are restricted to new development or substantial rehabilitation. Like the King County Housing Authority, some other mission-driven organizations, such as the National Housing Trust, have patched together state or local assistance with private market debt (and potentially project-based vouchers) to make such acquisitions feasible. Facilitating loans and grants to purchase rental properties tied to long-term affordability restrictions – including obligations not to discriminate against voucher holders – should be a goal of federal housing policy, including housing finance reform. While it’s important to include for-sale and multifamily acquisition strategies in a comprehensive strategy portfolio, tenant-based vouchers will likely remain the primary tool for enabling more poor and near-poor families to live in higher-opportunity communities. That’s true, given vouchers’ current scale — more than 2.2 million Housing Choice Vouchers are now in use — and their flexibility to rent virtually any type of decent-quality dwelling at a wide range of price points. Yet vouchers can do much more to expand housing choice. The implementation of HUD’s new Small Area Fair Market Rent (SAFMR) policy is a promising step, but other federal policy changes are needed to create stronger incentives for housing agencies to promote better locational outcomes. It’s also vital to make more funding available, from public as well as philanthropic sources, to meet agencies’ additional administrative costs of promoting voucher mobility. And federal policy should not only permit but encourage agencies to target vouchers combined with mobility assistance to families with young children living in the most severely distressed neighborhoods. Such efforts to foster inclusion may cost more, though experience with SAFMRs shows this isn’t always the case. But if we really care about outcomes for families over the long term, we can’t wait until there are sufficient resources to make housing affordable to all before we start paying attention to the types of neighborhoods families live in. The desperation and long-term harm of homelessness and housing insecurity create understandable pressure to spread the limited subsidy resources to help as many families as possible. Yet mounting evidence demonstrates the real long-term harm of growing up in a very poor, violent neighborhood and attending low-performing schools. Affordable housing alone doesn’t improve life chances; where families are able to live must also be a first-order concern, not one that we’ll pay attention to if and when we remedy the shortage of subsidies. While housing practitioners work to do the best job possible with the available resources, we must also build the political will to expand investments in housing subsidies, so that more families have the chance to overcome affordability barriers and live in communities of their choice. The Center for Budget and Policy Priorities, along with the National Low Income Housing Coalition and others, has just launched the Opportunity Starts at Home campaign, a long-term effort to achieve this goal. Fair housing can and should be a centerpiece of efforts to expand economic opportunity, asserted Dr. Raphael Bostic, President and CEO of the Federal Reserve Bank of Atlanta, who gave the 18th Annual John T. Dunlop Lecture at the Harvard Graduate School of Design on Tuesday, April 10 (watch video). His talk, on the past, present, and future of the Fair Housing Act, was given one day before the 50th anniversary of President Lyndon B. Johnson signing the measure. Bostic, who also served as Assistant Secretary for Policy Development and Research at the U.S. Department of Housing and Urban Development (HUD) from 2009 until 2012, explained that decades of research show the strong positive impacts that neighborhoods can have on children's education and future earnings. Given this, he noted, it is in everyone's interest to support efforts to expand opportunities for all families. "Fair housing is a key to economic mobility," he explained. "It is an economic development issue as well as a community and personal development issue." Bostic went on to discuss the two main strategies for achieving the law's ambitious (and, in many cases, unfilled) goals. One approach has been enforcement of the fair housing act’s prohibition on discriminatory treatment in the housing market– including actions brought by HUD against communities, and sometimes brought against HUD by activists and non-profit groups. The other strategy derives from the act’s mandate that federal grantees also have an obligation to affirmatively further fair housing, taking steps to promote integration and not just combat discrimination. During his HUD tenure, Bostic was instrumental in developing a new approach to structuring how HUD-funded communities should go about identifying and implementing such affirmative steps. While the former approach can achieve some success, it can ultimately produce only limited results, he observed. However, if carefully designed, the latter strategy has significant potential, asserted Bostic, as plans designed by the communities themselves with input from local stakeholders have a greater chance of being actively embraced. Given the current administration's efforts to slow and roll back some of those efforts, in the short run, enforcement efforts are likely to be the primary way in which supporters of fair housing will achieve their goals, he said. However, in the long run, people and communities will come to adopt more proactive approaches if only because an increasing number of them understand that America's long-standing history of upward economic mobility is at risk and that fair housing can be part of a solution to making sure that the next generation (and the ones that follow) continue to have access to the American Dream. Have Incomes Kept Up with Rising Rents? While renters’ median housing costs rose, in real terms, by 11 percent between 2001 and 2016, their incomes fell by two percent, according to our latest America’s Rental Housing report. Moreover, these changes were unevenly distributed across renter households, primarily affecting those who are least able to afford it. Housing costs (rents plus utilities) consumed an increasing portion of household income for renters who made less than the median income for all households. In contrast, incomes increased more than housing costs for higher-income renter households (Figure 1). Notes: Income quartiles include both owners and renters. Median housing costs and household incomes are in constant 2016 dollars, adjusted for inflation using the CPI-U for All Items. Housing costs include cash rent and utilities. Indexed values are cumulative percent change. Illustratively, the median monthly income for renters in the bottom income quartile fell by $50, dropping from $1,270 in 2001 to $1,220 in 2016 (a 4 percent decline). However, their median monthly housing costs increased by $70, rising from $690 to $760 (a 10 percent increase). This means that after paying for housing, renters in the bottom income quartile had less than $500 left to cover all other expenses (Figure 2), such as food, health care, insurance, transportation, and savings they could use for emergencies, retirement, education, repairs, or other needs. Notes: Income quartiles include both renters and owners. Housing costs include cash rent and utilities. Source: JCHS tabulations of 2016 American Community Survey. While residual incomes for the lowest-quartile group are slightly higher than they were in recent years, they are still 18 percent less than in 2001, when these households had $600 in residual income (in inflation adjusted dollars). Moreover, 48 percent of households in the lowest-income quartile consist of more than one person, and 27 percent have at least one child present. The situation is particularly bleak for renters in the lowest income quartile who spend more than 30 percent of income on housing. These cost-burdened renters had a residual income of only $360 per month in 2016, down 18 percent since 2001. In contrast, households in the same quartile that weren’t cost burdened had a residual income of $1,180 in 2016, down 6 percent since 2001. 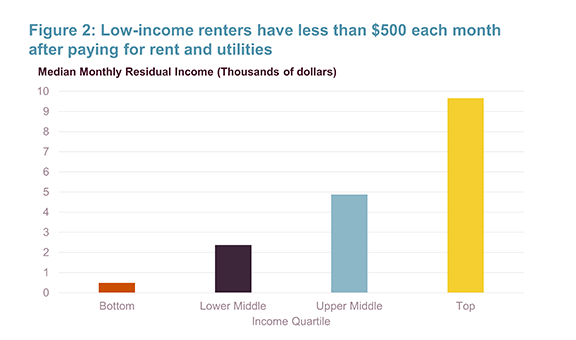 Part of this difference is due to the higher rates of cost burden among the very lowest-income renters within the quartile. Even so, cost burden reduces residual income. As noted above, the story is quite different for higher-income renters. Monthly housing costs for renters in the top income quartile rose by $320, increasing from $1,360 to $1,680 (a 24 percent rise). However, their monthly incomes rose by $890, increasing from $10,440 to $11,330 (a 9 percent rise). As a result, these renters saw their residual incomes increase from $9,030 in 2001 to $9,660 per month in real terms. What Would it Take for Housing Subsidies to Overcome Affordability Barriers to Inclusion in All Neighborhoods? What Would it Take for Housing Subsidies to Overcome Affordability Barriers to Inclusion in All Neighborhoods? by Margery Austin Turner, the panel moderator, begins by noting that, while there are many benefits associated with moving to higher-opportunity neighborhoods, the voucher and tax credit programs that are currently the largest source of federal subsidies for affordable housing often fail to offer those opportunities to low-income families. Part of the problem, she argues, is that too often, policies aimed at expanding access to opportunity-rich neighborhoods (i.e. fair housing policies) are pursued separately from housing subsidy policies, rather than as part of a strategic portfolio of investments. Such a portfolio approach would use different investment and interventions to four different types of neighborhoods. 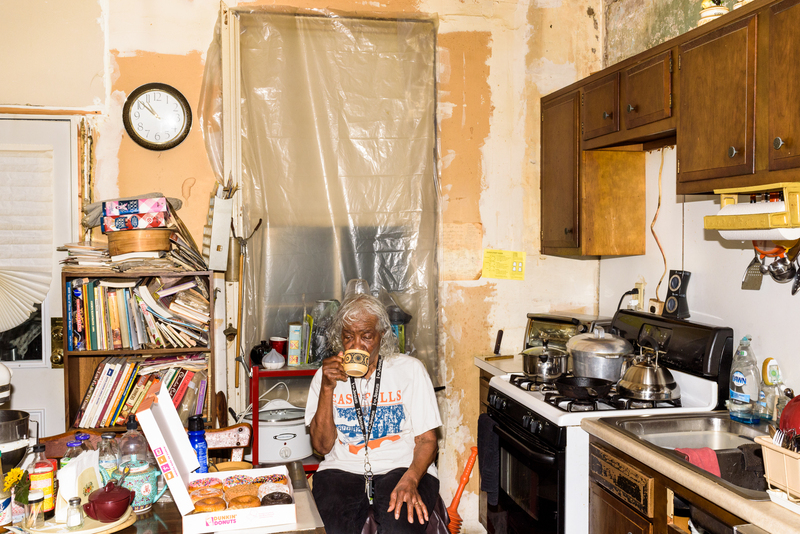 In severely distressed neighborhoods, subsidized housing probably should not be further concentrated, while in stable, low-income neighborhoods, subsidized housing investments should focus on renovation and preservation of the affordable housing stock. In emergent neighborhoods, preservation and expansion of affordable housing options should be the top priority, while in opportunity-rich neighborhoods, housing subsidies should be deployed (along with other policy tools) to expand affordable housing options. Expanding the Toolbox: Promising Approaches for Increasing Geographic Choice by Stephen Norman and Sarah Oppenheimer reviews the King County Housing Authority's (KCHA) ambitious efforts to use federal housing subsidies to provide families with broader neighborhood choice. Informed by growing national evidence on the effects of neighborhood quality on life outcomes, they note, KCHA has used both tenant-based mobility approaches and site-based affordability approaches to expand low-income families' access to a wider set of neighborhoods in the county, which includes Seattle and many surrounding communities. KCHA's tenant-based mobility strategies have included offering to pay higher rents in higher-opportunities areas and providing extensive counseling to voucher holders. The site-based strategies have focused on acquiring and preserving housing and using federal vouchers to support new development in higher-opportunity areas. As a result, about 31 percent of KCHA's federally-subsidized households with children currently reside in low-poverty areas. Expanding Access to Homeownership as a Means of Fostering Residential Integration and Inclusion by Christopher Herbert, Managing Director of the Joint Center for Housing Studies, notes that efforts to foster more inclusive communities have to confront issues related to housing affordability not only in more expensive, higher-opportunity neighborhoods, but in gentrifying ones as well. While many discussions about these issues focus on subsidized rental housing, Herbert argues that efforts to make homeownership more affordable should also be part of the portfolio of approaches used to foster more racially-, ethnically-, and economically-integrated communities. Potential appealing policies, he contends, fall into four broad categories: changes in federal income tax policy related to the mortgage interest deduction and savings; increased support for housing counseling; maintaining or modifying "duty to serve" obligations that affect mortgage lending; and better targeting and potentially expanding funding for downpayment assistance. He notes that, while these are not the only areas where action is needed to expand residential choice, they are critical (and sometimes overlooked) elements that should be included in a broader effort to foster more inclusive communities. Children experience many changes in their households while they are growing up. But while we often think about divorcing and remarrying parents as common changes in household composition that affect many children, in new research, I show that changes involving extended family members and nonrelatives are far more common than changes involving a parent. This finding is significant because prior research suggests that it is likely that instability involving nonparental household members affects children's outcomes. It is therefore relevant to assess the extent to which children are exposed to these transitions and how exposure varies by race and family structure. To gauge the extent of household changes, I used the nationally representative Survey of Income and Program Participation (SIPP) to track a sample of more than 72,000 children and their households over approximately two years. The SIPP interviews households every four months and documents the set of household members at each interview. This allowed me to identify the relationship between each child and each other household member and to determine who exited or entered the households between interviews. Overall, by the end of two years (after six interviews), about one percent of children experienced a change in household composition involving their mother and five percent experience a change involving their father. In contrast, more than 10 percent experienced a change involving a grandparent, aunt, uncle, cousin, or other extended family member. In addition, more than four percent of children experienced a change involving a nonrelative. This means that if we think only about divorcing and remarrying parents, we miss changes that affect 14 percent of children over a period of about two years. These rates vary significantly by type of household, by race, and by ethnicity. For example, 18 percent of children living with a single parent and 29 percent of children living with no parents had an extended family member enter or exit their households compared to only seven percent of children who live with two parents. Similarly, over 10 percent of children living with a single parent or no parent experienced a change involving a nonrelative compared to two percent of children living with two parents (Figure 1). 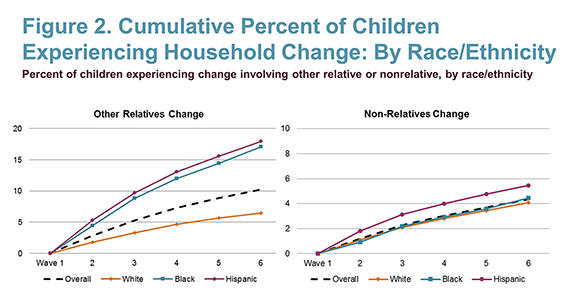 Moreover, 17 percent of black children and 18 percent of Hispanic children experienced a change in household composition involving extended family members compared to only six percent of white children. There is not as much difference by race and ethnicity, however, for changes involving nonrelatives. Rather, the rate clustered around five percent for all three groups (Figure 2). Taken together, these findings mean that considering only instability involving parents may not uncover differences by family structure, race, and ethnicity that a broader conceptualization of household instability would reveal. This is important because many studies find that divorce has negative effects on children's well-being. My research showing the much more widespread exposure to changes in household composition highlights the need for future research that assesses whether these other changes in household composition are detrimental—or beneficial—for children. For example: do the distraction and stress from instability involving relatives and nonfamily members mean children perform less well in school or have more behavior problems? Or do some types of changes reflect closer relationships with extended kin that are beneficial for children? Such questions, which were beyond the scope of my analysis, clearly merit further attention. These descriptive findings and future work on the consequences of household instability for children could also have implications for housing policy. If high housing cost burdens and a lack of affordable options contribute to changes in household composition and if those changes are detrimental to children, then expanding the supply of affordable housing and targeting it to specific households and/or specific high-cost or low-income geographies could greatly help those children. Moreover, such policies could have meaningful spillover effects because providing housing assistance to families not only might benefit children in the family that receives the assistance, but could also help children in the households their families otherwise would have joined when they doubled up with extended family members or nonrelatives.